I’m new to the Sunday snapshot game. 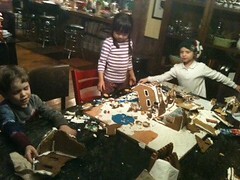 But I thought anyone who’s been following along might wonder what ever happened to our BIG gingerbread mansion. After weeks and weeks of “we we gon’ eat that? When? I wan’ eat that candy but I CAN’T!” eventually, they could. I wouldn’t have, but they did. Although not, I think, nearly as much as they thought they would.